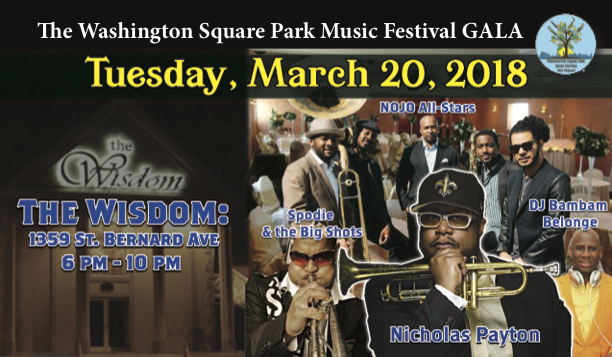 The Washington Square Park Foundation for the Arts, LLC held 2 Galas ahead of our 2nd Music Festival season last year. As you may remember, we honored Ray Charles and Al Jarreau the previous year. This past year we to honored Tina Marie, Bob Marley, Nina Simone, James Brown and Alan Toussaint. These Galas are a way for us to kick off our season and raise funds toward producing these fun concerts in the park. Thank you to all who helped support us through these galas. Our first Gala last year was a tremendous success. Held on Tuesday, March 20, 2018 at the Wisdom Hall on St. Bernard Avenue, we served a 5 course meal, 4 hours of live music and an open bar. We had pre-sold 40 seats. There were 50 additional seats for sale. 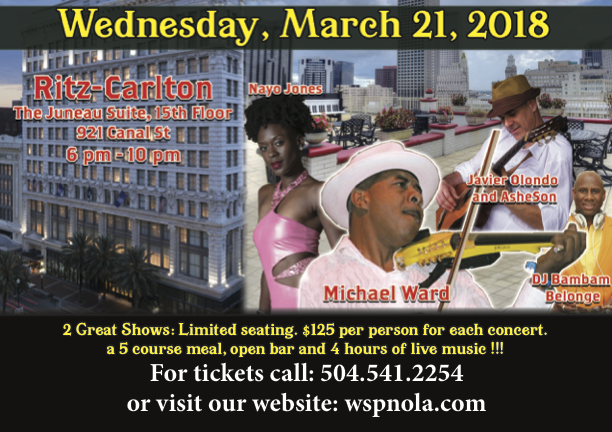 The entertainment was Spodie and the Big Shots, Adonis Rose with the NOJO All-Stars and closing out the show featured Nicholas Payton with Chris Severin and Herlin Riley. The second Gala on Wednesday, March 21, 2018 at the Juneau Suite at the Ritz-Carlton again featured a 5 course meal, 4 hours of live music and an open bar. There were over 80 people in attendance. The music was Nayo Jones, Javier Olondo and finishing out the show was Michael Ward with a surprise performance by Dee Dee Bridgewater.